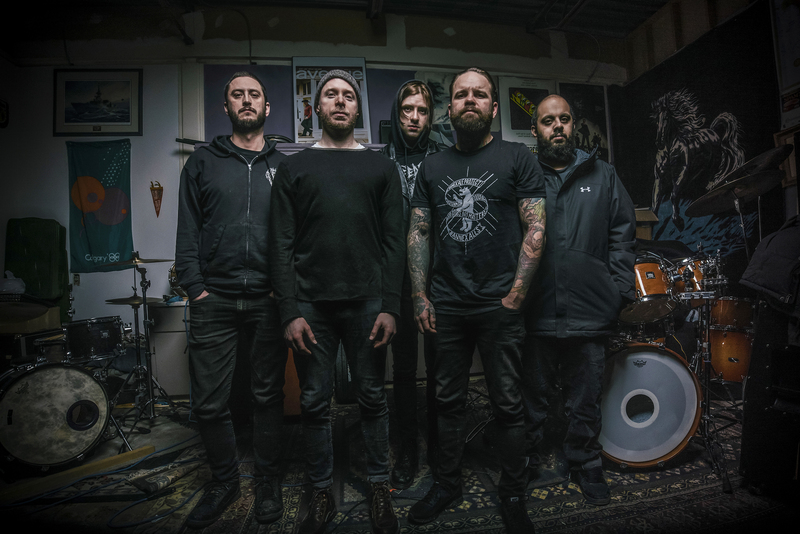 Canadian grind legion WAKE share their blistering new album ‘Misery Rites’ today via Noisey along with an exclusive interview with vocalist Kyle Ball. Head over to Noisey now. Order ‘Misery Rites’ ahead of it’s February 23 release via Translation Loss Records. Misery Rites, WAKE’s sophomore album, delivers nine thunderously crushing songs and takes a harsh, introspective, and shattering look into the deep, interdimensional corners of intimate struggle. Vocalist Kyle Ball explains, “Misery Rites is a concept that contains personal struggle with depression, addiction and isolation. It also follows a theme of cycles, the main cycle being the metaphorical killing of the person you hate being only to eventually end up back in the same place, just to start the cycle again.” WAKE face their inner torment with fury and weave dark, caustic guitar playing and bludgeoning drums to create the raw, dark terror throughout Misery Rites. Misery Rites was recorded, mixed, and mastered in 2017 with Dave Otero at Flatline Audio (KHEMMIS, PRIMITIVE MAN, COBALT). WAKE guitarist Rob LaChance reveals their vision for Misery Rites; “musically, the vision of the album was to take what we did on Sowing The Seeds of a Worthless Tomorrow and make it darker and more oppressing.” Rob continues, “I think having Dave Otero on production helped capture a lot of what we were going for. Dave is a very talented guy and one of the best engineers in the game right now. Recording in Denver also made it easy for us to have our good friend Ethan McCarthy (PRIMITIVE MAN, VERMIN WOMB) do some vocals on a few tracks”. From early tours leaning on nothing but the DIY release of Surrounded By Human Filth, to multiple Maryland Deathfest appearances, and European tours with Relapse Records artists PRIMITIVE MAN, they released LPs via the inimitable Nerve Altar records. Logging tens of thousands of miles alone in the middle of the USA or with a host of Americas best heavy bands, WAKE have proved that over the course of the decade, their workload and fury are never-ending. After finishing Misery Rites with Dave Otero at Flatline Audio, an August European outing with BACKSLIDER, and various festival appearances, WAKE carry on the same as usual in 2017 and beyond – scorning the weak, ignoring the trends, and digging heels into the road. In support of their February 23rd release of Misery Rites, WAKE have announced a string of tour dates that lead them through Canada and the United States, beginning on March 10th. WAKE will then join blackened death/doom powerhouse WITHERED (Season Of Mist) on March 27th, which will lead them throughout the United States and Canada for 13 dates, delivering their harrowing death-grind along their path. The tour is sponsored by CVLT Nation, Hexagram Booking, Season of Mist, and Translation Loss Records. Misery Rites is scheduled for release on February 23, 2018 and will be available on vinyl, compact disc, cassette, and digital. Vinyl is available in two colours. Black with Heavy White Splatter (limited to 300) and Black Inside of Milky Clear (colour in colour) with Heavy White, Bone White, and Grey Splatter (mail-order exclusive, limited to 200). Pre-order is available now through Translation Loss Records.